A constant is an entity that doesn’t change whereas a variable is an entity that may change. 'a' is variable & '10' is constant. Variable 'a' value can be changed to '20' or '30' but you cannot change '10' or '20' or '30' . These are constant values . In simple words , just a number in this example . To declare constants in Swift 'let' keyword is used. Semicolons are not compulsory in Swift Language. But remember if you add two statements in a single line you have to use ';' as delimiter to separate them. Otherwise, it shows syntax error. 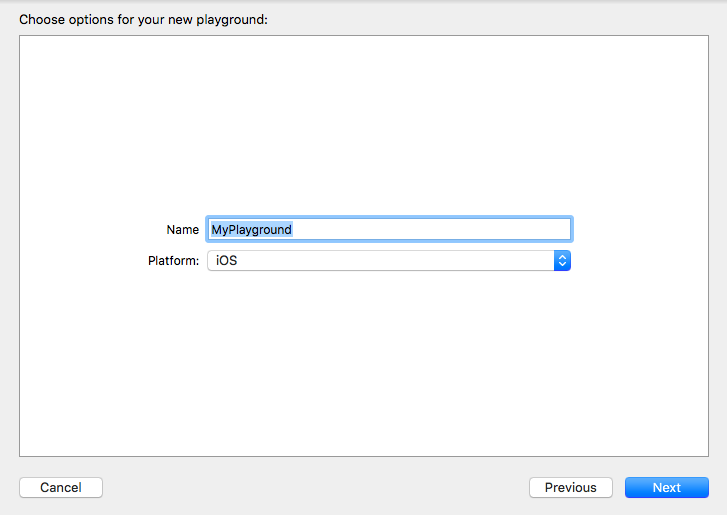 Let's create a sample playground , Goto File > New > Playground > Next. Run the program in the playground. Annotations are used to specify the type to constant. With the help of Type Annotations it will be clear what kind of value that specific constant can store. And this can be done by placing a colon after the constant or variable name, followed by a space, followed by the name of the type to use.